Basement Waterproofing Services - Finishing, Foundation Repair, Mold Remediation. 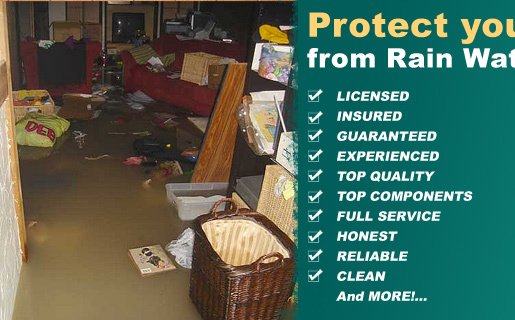 Rain King can, and will fix your basement flooding problem. It’s amazing how water can be one of the most destructive things to a structure, especially a basement, so there is a great need for basement waterproofing. New York, New Jersey, and Connecticut residents understand that basements are particularly vulnerable to water damage since they are at the lowest level of a building. Water damage can expose your house to structural instability as well as mold and mildew. Mold and mildew can unknowingly damage your health. Our experts at Rain King will take care of your basement waterproofing in New York, New Jersey, or Connecticut so that your home does not suffer any water damage. We provide estimates for the required work and take the time to evaluate your home before any work is done. We assess any necessary foundation repair and begin our work until that is properly handled so that your basement waterproofing endures the test of time. Our experts will gladly explain the process that will provide the best basement waterproofing work. The work done by our experienced staff is guaranteed to last because we take our time evaluating your space for waterproofing needs, including foundation repairs. A waterproofed basement means that you add a viable living space to your home, instead of a problematic flooding area. Our Basement waterproofing in NY, NJ, and CT allows you to use the space for virtually anything else, including a family room, an exercise room, or a guest room. The possibilities are endless! Let us at Rain King show you what a great space your basement could be with the right waterproofing. 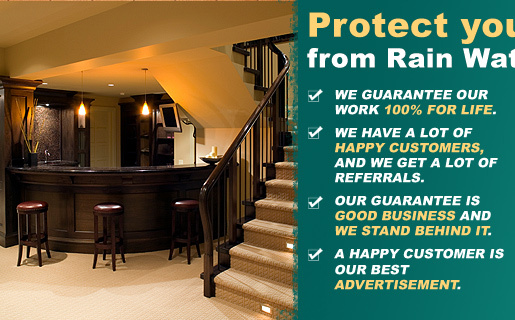 Rain King is one of the best contractors of basement and crawl space waterproofing services in the nation. We have a 100% success rate with our customers, and you could have the same kind of success in your basement, too, if you call Rain King! Rain King offers a 100% Lifetime Guarantee. We don't make that guarantee lightly, and we would not make that guarantee if we weren't willing to stand behind it. At Rain King we're experts in Basement & Crawl Space Waterproofing and Conditioning, Mold Remediation, Dehumidification and related services. We are a FULL SERVICE COMPANY. What does that mean to you as a customer? A lot! Not only can we make your wet basement dry and condition your crawl spaces to increase the value of your home, but we also take care of everything that goes with it! We can install electrical connections for your sump pump and dehumidification systems; perform extensive structural and foundational repairs (we don't just patch, we fix the whole problem! ), provide first class basement finishing and remodeling and more. Other contractors do only part of the job. We do it all! We stand behind our work, SO LOOK NO FURTHER! Protect the value of your home, NOW! Full Service Company - We Do It All! "In this type of real estate market you're not going to sell a house with a wet basement. Get it fixed and get the full value for your home. I would recommend The Rain King. They're a very reliable, honest company. "We guarantee our work 100% for life. "We have a lot of happy customers, and we get a lot of referrals. "Our guarantee is good business and we stand behind it. "A happy customer is our best advertisement."